If you have children or grandchildren aged three years and upwards you’ll know how much they like exploring things, and also how they like an area of their own where they can let their imagination run free. 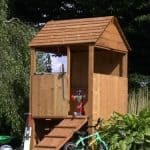 This is an ideal and inexpensive playhouse for fulfilling both of these factors. It’s also a safe play area, as demonstrated by its meeting the EN71 specification known as the European Toy Standard. The tower itself has two levels, both of which offer different play environments for children. One is a semi-enclosed den at ground level, and the other is a raised stockade that is partially open to the elements. On top of the tower sits a slatted apex roof, which helps to ensure that rainwater is carried away from the boundaries of the play area. We were pleased to see that tongue and groove cladding was used for the walls of the play area, as this too is weather resistant as well as being strong and reliable. It’s worth noting that it will need treating on a yearly basis, but one helpful extra is the free tub of basecoat that is supplied with this playhouse. This can certainly be an aid to the first year’s treatment requirement. This is a well sized play area that will keep your children or grandchildren happy and out of mischief when the sun is shining. We all know that children are spending too long inside now, whether it’s watching television or playing with a tablet or video game. 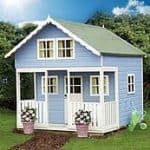 That’s why we think this playhouse is so useful, it may be very traditional but it will be loved by children just as much today as it would have been when we were young. Constructed solely of timber as well, this makes a very attractive feature for your garden rather than standing out as some brightly coloured playhouses can do. The apex roof at the summit carries water away very effectively, but it also gives the stockade tower a little extra height. The ridge height created by it is 2.35m, and the eaves height is 1.82m. The overall width of the building is 1.24m and the overall depth is 1.21m. When choosing a place to situate the playhouse, however, you’ll also have to take into account the ramp which creates a depth of 2.43m. The ramp is part of the fun itself as it’s a an easy climb access ramp that leads up to the stockade level. Rather than standard steps, it’s an easy sloping ramp with five supports along its length. Kids will love climbing up it, and they’ll enjoy the stockade at the top of it even more. 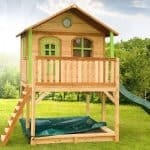 The bottom portion is covered by cladding, whilst the upper section is open to the elements, so whether they’re pretending it’s the bough of a ship, or the lookout tower of a fort, your children will be getting lots of valuable fresh air. Underneath the stockade is another area, enclosed on three sides, that can be used by den. On hot, sunny days it will be in the shade and can be a perfect place for inquisitive young minds to read a book or draw. We were impressed by the cladding used for the walls of this playhouse as it’s shiplap tongue and groove cladding that’s very effective at locking rain out. At 12mm thick it’s as strong as the cladding we see on any playhouse that we’ve reviewed, and the 27 X 45mm framing is stronger than most. The roof above it is made up of overlap square-edge cladding, which again is good at resisting rain. The floor, also with a thickness of 12mm, is open slatted but this means that it drains very quickly and so cuts down on maintenance. 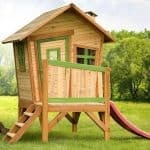 We found lots of things to like about this playhouse, but we do wish it had been pressure treated rather than dip treated as this gives longer lasting protection. 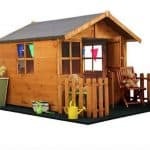 As it is, the playhouse comes with only the statutory one year warranty against rot, and there’s also a requirement for the owner to treat it with wood preserver themselves on a yearly basis. This can be a time consuming, although essential process, but we did appreciate the free tub of treatment that’s provided with every purchase. There are no doors and windows as such, but there is an entrance and openings. By that we mean that the space at the top of the ramp acts as a doorway, and this has a width of 0.38m and a height to the apex roof of 1.15m. The three openings between the support struts, one at the front and one at each side, also take the form of windows even though they are open to the elements. The back wall is fully boarded with tongue and groove cladding. We welcome the lack of windows, as it means that there is no chance of any broken glass. 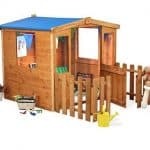 It’s just one of the features that makes this a very safe environment to have fun in, which is always our prime consideration for any playhouse. The European safety mark is a welcome affirmation of that, although as the stockade tower does have a raised level, it’s important of course that children using it are supervised. 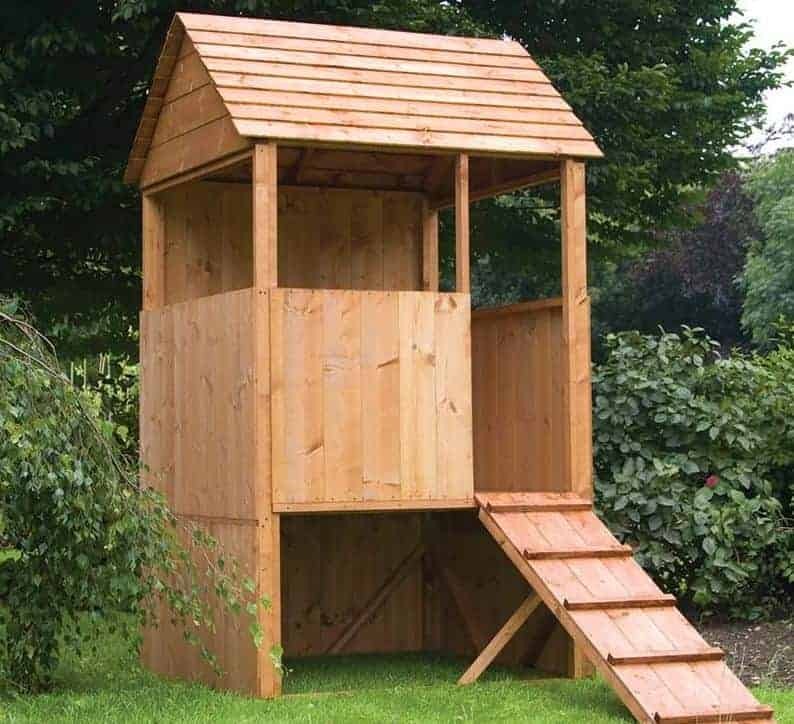 Whether you’re a parent or grandparent, you might find it difficult to find the time to spare to erect this playhouse yourself. That’s why we were pleased to find that an optional assembly service is available. For a cost of £109.99, which we think is a reasonable price, you can be sure of a perfect installation by a team of professionals. If you have the time and ability to do it yourself, but not necessarily the tools, then a DIY tool kit can be bought for just under forty pounds. One extra that we would highly recommend is a tub of wood stain. Available in four different natural shades it protects the timber from the potentially damaging effects of the sun. Alternatively, you could let your children choose colours of their choice from outdoor paint ranges. We were impressed by the quality on display throughout this playhouse, as shown by the same thickness of cladding used for the floor and roof as the walls. Even though the cladding is of a high quality, regular treatment with wood preserver will be required to get the most out of this building. Whilst we have seen bigger playhouses, the two distinct levels still mean that there’s a lot of space for children to enjoy. With clear instructions, this is surprisingly easy to install and with a friend’s help it can be completed in as little as four or five hours. At a price that’s much less than you’d expect to pay for the latest video game console, we feel that this represents good value for money. Final Thoughts: We found this playhouse to be both attractive and versatile, in that its use of open spaces really allows young minds to turn it into whatever they imagine. It’s really a space that all the family can enjoy, as you watch your children or grandchildren indulge their creativity and their sense of make believe. Just as importantly, it’s very well constructed so it should last for a long time to come as long as the yearly retreatment requirement is adhered to. 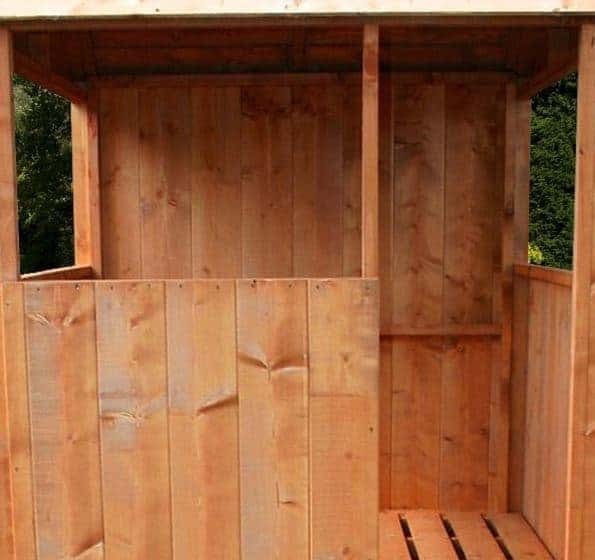 It’s also compact enough that it won’t take up too much of your garden space, whilst still providing a well sized play area whether on the upper stockade or in the lower den.